How do I use AskAdStage? 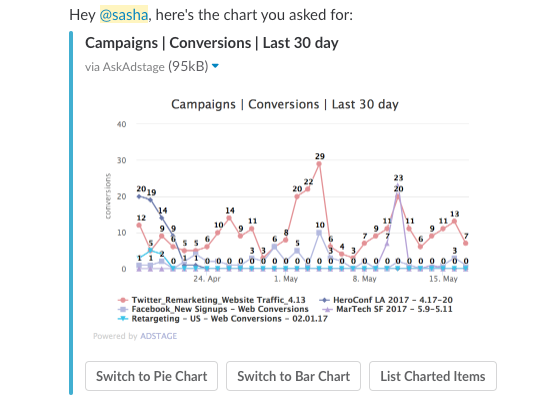 AskAdStage is a free Slack application that allows you to quickly access and take action on your Report data within Slack. In this article, we'll cover how to integrate the app with your company's Slack, generate charts and lists, and take some action without having to open AdStage. Getting started with AskAdStage is simple. Once you download the app here, you can start inputting commands and generating data right away. It's important to note that you'll need access to an AdStage account to be able to use generate charts, lists and take actions. That being said, all Slack team members will be able to view everything you procure with AskAdStage. How do I "ask AdStage"? To start generating lists and bar/line/pie charts, simply hop into Slack and make a command. To start your call type /AskAdStage. From there, add in what you'd like to see. You can also use AskAdStage to make some quick changes to your campaigns, ad groups/sets, or ads. After generating a chart, select "List Charted Items", then click either Pause or Enable. Alternatively, you can also pause and enable by entering the call /AskAdStage Pause or /AskAdStage Enable. From there, AskAdStage will prompt you to select which campaigns/ad groups/ads you'd like to pause or enable. What are some common ways to use AskAdStage? Chart Data From All Your Paid Ad Campaigns: This is the quickest way to share your campaign performance with your team. Simply make a "Chart" command using /AskAdStage. Take Action Right From Slack: Pause or enable your ads/ad sets/campaigns based on performance without logging into AdStage. How do I set up AskAdStage? Step 3: Start making AskAdStage commands. Welcome to your new, more efficient workflow! Have questions or feedback about AskAdStage? Feel free to reach out to us at support@adstage.io.